Genes that increase susceptibility to age-related macular degeneration (AMD) have been identified; however, since many individuals carrying these risk alleles do not develop disease, other contributors are involved. One additional factor, long implicated in the pathogenesis of AMD, is the lipofuscin of retinal pigment epithelium (RPE). The fluorophores that constitute RPE lipofuscin also serve as a source of autofluorescence (AF) that can be imaged by confocal laser ophthalmoscopy. The AF originating from lipofuscin is excited by the delivery of short wavelength (SW) light. A second autofluorescence is emitted from the melanin of RPE (and choroid) upon near-infrared (NIR-AF) excitation. SW-AF imaging is currently used in the clinical management of retinal disorders and the advantages of NIR-AF are increasingly recognized. 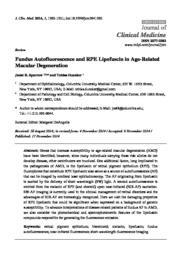 Here we visit the damaging properties of RPE lipofuscin that could be significant when expressed on a background of genetic susceptibility. To advance interpretations of disease-related patterns of fundus AF in AMD, we also consider the photochemical and spectrophotometric features of the lipofuscin compounds responsible for generating the fluorescence emission.